League of Melbotis: Whatever Happened to the Man of Tomorrow? I do not claim to be "proud" to own many comics, but these are some of them. 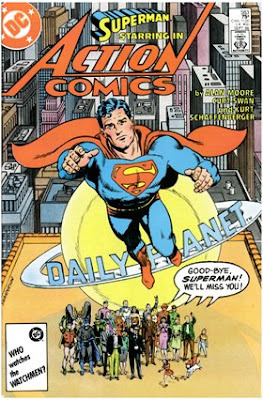 Weren't you doing a bit about tear-jerker moments in comics? You know I'm a dog person, and Krypto's final scene in WHTTMOT gets me every time. Moore's WHTTMOT and Morrison's All Star Superman are my two favourite Supes stories of all time. Whatever Happened to the Man of Tomorrow didn't actually make me weepy, like We3, but I will say that the implications of wrapping an ongoing modern myth floored me, especially given the fates of so many familiar (and your mileage will vary, but beloved) characters. And, of course, yes, the Krypto scene was particularly poignant. As per favorites, that sounds like a great column idea for some day.